With a new location, new menu and new approach, the Blue Mermaid is excited to roll into 2018. Voted Best Greek! Featuring authentic Greek cuisine, Cafe Nostimo offers a variety of salads, souvlakis, gyros, spanakopita, moussaka and other Greek favorites. The Dinnerhorn offers a popular and extensive menu featuring fresh native seafood, while the Dinnerhorn's pub, the Bratskellar, offers pizza and hearty sandwiches. 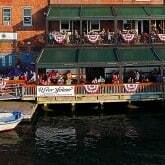 The Dolphin Striker has been one of the hallmarks of elegant dining on the Seacoast for over 20 years. Our food is sourced locally, creatively prepared and beautifully presented. Located just two blocks down from Market Square, Jay's has become an overnight institution among locals who appreciate exceptional seafood. Casually hip, with no pretense. Reservations encouraged. A from-scratch eatery specializing in outside-the-box lunch cuisine and catering, both corporate and large-scale events. Open for weekend breakfast, daily lunch and Wednesday through Saturday dinner. Liars Bench Beer Company is a local, independently owned nano-brewery and taproom founded in 2016 in the West End of Portsmouth, NH. Martingale Wharf, located on the water’s edge and boasting the largest deck in Portsmouth, offers a fresh, balanced and locally sourced menu. A fixture on the Portsmouth waterfront for 22 years, the Old Ferry Landing offers fine food and beverages and a deck adjacent to Portsmouth's tugs. Ore Nell’s Barbecue serves premium meats smoked low and slow over oak wood using traditional Central Texas inspired cooking methods. Popovers on the Square is a casual cafe located in the heart of historic Market Square. We embrace the European philosophy of fresh, seasonal food, outstanding coffees and fine wines, relaxing ambiance, and of course, exceptional pastries and desserts. Four venues, under one roof, known for wood-fired cooking and live entertainment. The River House features classic seafood favorites complemented by contemporary dishes served on our decks, heated balcony and dining rooms overlooking the Piscataqua River. Located in the heart of Kittery Point, Maine, Robert’s Maine Grill serves up locally-sourced Maine cuisine in a modern, welcoming ambience to locals and travelers alike. Homestyle food - with a twist! 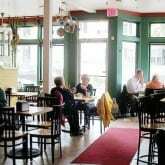 We serve breakfast all day, great burgers and sandwiches, Phantom Gourmet award-winning BBQ, comfort-food classics like meatloaf, roast turkey, local New England favorites like fish and chips, and the best lobster roll around. Surf sets the standard in New Hampshire for fresh, exquisitely prepared seafood. Guided by chef and owner Michael Buckley, Surf has built a reputation for imaginative cooking with the very freshest fish and shellfish. Enjoy one of the most authentic New England dining experiences right here on the New Hampshire Seacoast. 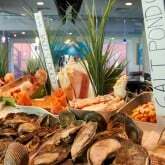 We offer lunch and dinner while specialize in seafood and ice cream. Take out or eat here. Inside dining and outside picnic tables. We prepare everything fresh each day. The Works: Community cafés featuring delicious breakfast and lunch sandwiches made with antibiotic- and hormone-free meats and local cage-free eggs on artisan breads and traditional NY-style bagels. Fresh salads, hearty soups, real-fruit smoothies. Thoughtfully sourced. Three Chimneys Inn features settings for both formal and casual dining. 'Maples,' with its four fireplaces and Georgian furnishing, offers fine dining in a candlelit atmosphere. 'The Tavern,' with its granite walls, fireplace and massive beamed ceilings, provides a cozy spot for casual dining. And in season, 'The Conservatory' is a delightful place to dine in the shade of an old English grape arbor. Tulsi's inspired menu boasts delectable Indian cuisine of traditional North Indian, Moghlai and contemporary dishes made with only the finest and freshest ingredients. Travel and Leisure magazine named Tulsi as one of the "Best Indian Restaurants in the U.S." in April 2014. At Tuscan Kitchen and Tuscan Market, our chefs prepare everything in house. All of our pastas are made fresh, our bread crafted daily in our artisan bakery and our desserts are carefully created by master pastry chefs.